For what it's worth, and consider the source... This could all be rumor. Casey Anthony is said to be telling close friends that she's pregnant. The UK Daily Mail, in a story dated March 13, 2013, is citing a report from the National Enquirer tabloid claiming Anthony is thrilled at the chance to 'prove' that she is a good mother even after she was acquitted of killing her first daughter Caylee. The National Enquirer published a story based on the claims of multiple unidentified sources saying that the infamous mother is pregnant. 'She just said that she fell in love with a very wealthy man while she's been in hiding. Casey said he's taking care of her financially and he's so obsessed with her that he'll do anything for her,' an unnamed insider told the tabloid. If she continues to keep the identity of her partner a secret, it will be the second time that the identity of her child's father is kept a secret, though she apparently does know the man in this case. The National Enquirer also reported Anthony was pregnant in July, 2011. Yet, WDBO News is unable to find a current story from the National Enquirer about Anthony being pregnant. Casey Anthony is allegedly telling close friends that she is pregnant with another child and is thrilled at the chance to 'prove' that she is a good mother even after she was acquitted of killing her first daughter Caylee. Lets hope it's a rumor. Yes, please let it be a rumor. It sound exactly just like the same rumor as last year. Even the source. Enquirer needs some sales money. So where is George and Lee these days? That's what Jose would say? 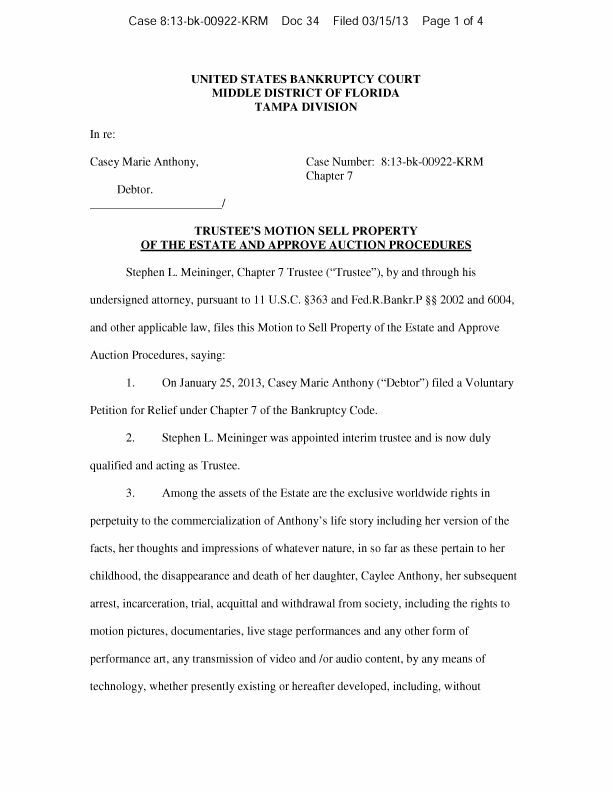 In a new court filing, attorneys for Casey Anthony argue Zenaida Gonzalez's lawyers already had their chance to question Anthony about her finances, and shouldn't be granted a second opportunity. The filing comes after Gonzalez's legal team asked U.S. Bankruptcy Judge K. Rodney May for an examination of Anthony, similar to a deposition, in order to find out more about her finances. At a creditors meeting earlier this month in her recently filed Chapter 7 bankruptcy, Anthony testified that, through her attorneys, she had received money and other gifts from well-wishers. She didn't identify those people. She also declined to identify who's been supporting her day-to-day needs. Anthony testified that she pays no rent or utilities, and lives "for free," thanks to the kindness of unnamed "friends." The Trustees motion considers every little way they might try to get money from KCs story and lumps it all together for sale to the highest bidder. The highest so far wants prevent any chance of her making money. What's to stop one of her attorneys from buying it? Hopefully they are tired of throwing money down that hole. It;s a big gamble for them especilly after they have seen the reaction so far. "That's the latest development in Anthony's bankruptcy case. 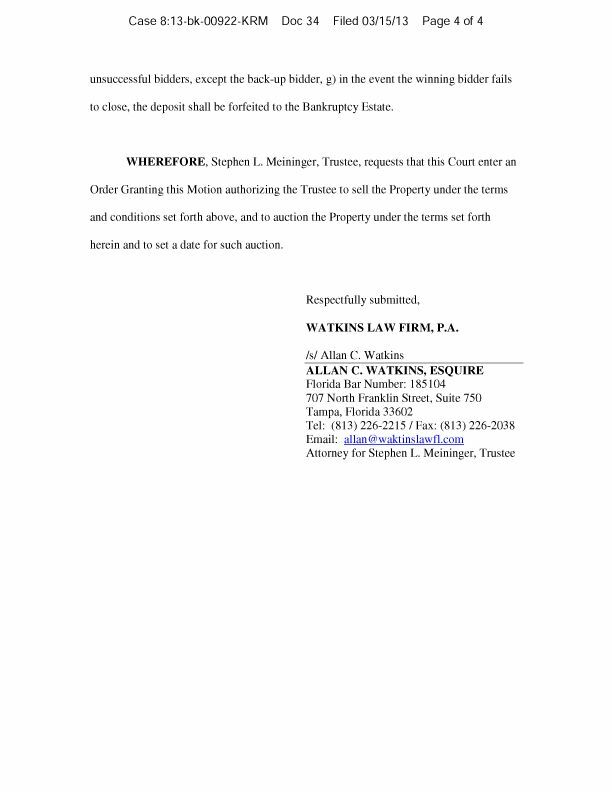 Stephen Meininger, the trustee appointed by the court to determine Casey's available assets, has asked the court to hold an auction. "Due to the intense public interest in the debtor and the property, the trustee believes that there will be interest from others in purchasing the property," Meininger said in a motion filed Friday. The motion was prompted by an offer from James Schober, who appears to live in Boynton Beach. 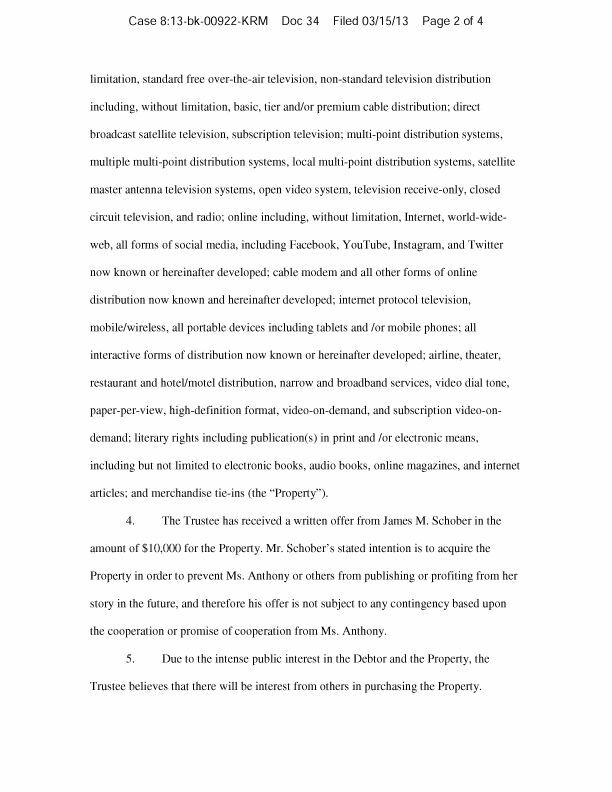 Schober has offered the bankruptcy court $10,000 for the rights to any form of publication of Anthony's story. 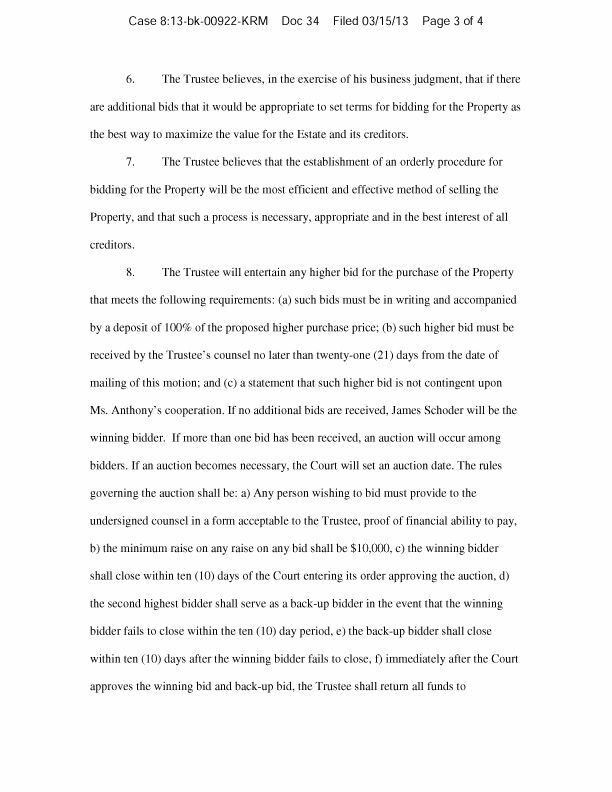 "Schober’s stated intention is to acquire the property in order to prevent Ms. Anthony or others from publishing or profiting from her story in the future, and therefore his offer is not subject to any contingency based upon the cooperation or promise of cooperation from Ms. Anthony," the motion stated." What exactly does that mean? Then she can never sell her story? Hi Cookie! That's the way I read it. Wouldn't that be WONDERFUL? I'd love to know that she would never be able to profit from murdering that child! !